We run courses for adults to improve their IT skills. Currently we are not running accredited courses but we do provide volunteer-supported learning in all aspects of IT – from using your tablet to search the web, email or Skype to basic Microsoft Office skills. 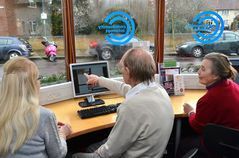 Contact Us or pop into the Centre and tell us how we can help you. If you would like help, support or advice on writing a CV, preparing for a job interview or benefits while you are seeking employment, please pop into the Centre and ask for Simon or Sarah. We also have a wide variety of volunteering roles to help you gain work experience. Once you have been volunteering with us for a while, we can give you a reference for future employers.